Heeft u een vraag voor Pink House? Met een gunstige locatie in religieuze interesse, bezichtiging van bezienswaardigheden, cultuur in Dharamshala, biedt Pink House u een zeer aantrekkelijke plek om even te ontspannen in drukke tijden. Vanuit hier kunnen gasten genieten van alles wat de levendige stad te bieden heeft. Dankzij de praktische ligging, biedt de accommodatie eenvoudig toegang tot alle belangrijke trekpleisters van de stad. Bij Pink House staan de excellente service en de superieure voorzieningen garant voor een onvergetelijk verblijf. Voor het comfort en gemak van haar gasten biedt de accommodatie 24-uur roomservice, 24-uur receptie, wi-fi in openbare ruimtes, parkeerplaats, roomservice. Alle gastenkamers beschikken over een variëteit aan voorzieningen. Vele kamers beschikken zelfs over plasma tv, locker, spiegel, slippers, handdoeken, zodat zelfs de meest veeleisende gast tevredengesteld zal zijn. De accommodatie biedt talrijke recreatieve mogelijkheden, zodat u voldoende te doen heeft tijdens uw verblijf . Geniet van een geweldige locatie en ongeëvenaarde services in Pink House. De accommodatie vergt dat gasten gebruik maken van trappen en is mogelijk niet geschikt voor ouderen of personen met beperkte mobiliteit. Tegenvallend. De recenties waren enthousiast. Maar...we moesten vragen om handdoeken, wc papier, glazen, schone lakens en warm water. Wastafel hing half los. Manager regelde alles uiteindelijk maar er kwamen geen excuses. Na 1 nacht konden we naar een andere kamer verhuizen. Er werd niets ondernomen om het entree van het hotel iets op te knappen. Het was een grote modderzooi. We zaten in het tweede gebouw. Erg ongezellig. Maar het kwam niet meer goed tussen het hotel en ons. Pleasant, comfortable and clean room . Fan heater provided on request during cold weather. Friendly and helpful staff. Good food and great mountain views. Good location close to amenities. A very enjoyable stay. I would recommend Pink House if you bring your own sleeping bag and bed sheet and only if you need to secure a room in advance. If you have the option to shop around after you arrive, I suggest just book one night. Once you pay the room in advance, it's hard to negotiate the quality of the room or ask for a reasonable upgrade. The views are great from the rooms / balconies. And the café is nice. But it’s more of a hostel than a hotel and it’s run by a bunch of young guys with no real customer service experience. The WiFi never worked (they told me that it doesn’t work with iPhones and iOS devices). I ended up checking out early and going up the hill. It’s a pretty noisy party area. - a bit pricy for the area + very clean and staff is always available. Amazing vue on the triund summit from upper terrasse. Hot water very welcome! I think is a great hotel for the money, however there is one very important aspect that everyone should be aware. He hotel is off one of the main road not too far from the city cente, which is great. BUT, to get to the hotel you need to go down 99 large steps (yes, I did count them), then you need to go up to the recepción (31 steps) and then go down again to your room. Mine was 205, so was 31 steps down. Now, do this 3 or 4 times a day with a backpack and you will know what I am talking about. Not for those out of shape but great for those that are trying to lose some weight. We had a good stay at the Pink house. It is located quite close to all the tourist places and the staff is extremely helpful. Average hotel with great view of mountains. Lack of restaurant facility. One has to get down 80 high steps to reach to it. No parking facility. Elderly people avoid it.Again people has to climb up 80 high steps to go to market area. They say they are renovating but when we went there was no room service which was really disappointing..! So either one need to have dinner and come back to the hotel or go and get the parcel. Climbing so many stairs to reach main road was on herculean task..! So room service is a must. Second, phone lines go dead after 10 PM. We had one extra bed but they forgot to provide it.. When I tried phone after 10 PM it was dead. Further I went down to the reception and there was no one.. almost for 30 mins..! Rest, view from our room was great.. room was perfect.. hot water 24*7. LED TV..! Enjoyed our stay at this basic but pleasant hotel. Reasonably clean and things in the room worked OK. The view from our room was wonderful. The staff are nice and helpful. Downside is the location. Everyone talks about the steps up to the town and they really are a killer! If you stay here get fit first! Simple accommodation, with not very clean facilities. Towels and soap are complimentary. Overpriced compared to rates for local travellers. Generally helpful, English-speaking staff. Always bargain and be prepared to be overcharged for any service (travel arrangements, guided tours, taxi etc.) Accessible through a lengthy flight of stairs: travel light or with a backpack rather than on wheels. If arriving by cab make sure to have a hotel map with you. Very happy stay....wondeful views from room and terrace/restaurant ...friendly,helpful manager,nothing too much trouble for him ....highly recommended! View from Balcony (if on higher floors), Comfort. Overall stay was OK. Its location is not good, as one has to move downstairs (almost 100-120) and then move upstairs to the room. The staff was not very good and not very bad. We upgraded our room (from Standard to Deluxe) because - 1. Toilet/Washroom weren't clean and ceiling was leaking, 2. a humdrum environment and balcony. I would not recommend this hotel if you are travelling with family or in goup or plan to stay for longer. I pre-booked a deluxe luxury room. On arrival, the receptionist was more interested in the cricket than my arrival, and I was given a very ordinary room 10 metres from their building site, and 10 metres from a noisy bar next door. They should warn guests that building work is going on there. You can't get in without dodging broken tiles, cement dust and builders. It was amazing stay despite some rainy weather. The place is just in 7min walking distance from the Dalai Lama temple which has amazing walking trail around. 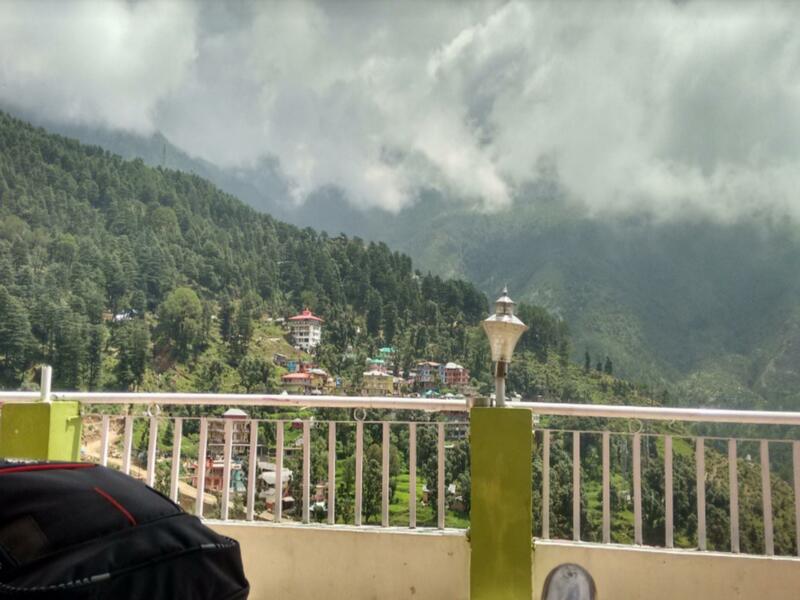 McLeod Ganj is a very picturesque place and the hotel location is good. Rooms are very clean, wifi worked without problem, there is also cafe on the rooftops which are very nice to sit at. Staff is helpful and can advise where to go and help with whatever questions you have. It is one of the budget places to stay and definitely worth the money you spend. When i am back to Dharamshala, i will definitely choose it again for my stay. We loved our stay at the Pink House. It had a humble and sweet atmosphere. We felt very welcome. It's simple accommodation but it ticked all the basic boxes. Hot shower , comfy bed , and room service for a hot tea on a cold morning. Onkar one of the staff. The room they first showed me was the size of a shoe box. I was moved to anther room and they told me it would be an extra charge of 80 dollars. My friend was in the room beside me and paid much less. I feel I was ripped off. Not impressed. It's not about the Pink House...it's about what's around it. Construction, d'or tunes, odeurs (the staff was pain tong cabinets with oil paint hear us while we were waiting on their roof top Terrace). We could also small cigarette fumes from our next d'or neighbour, which is quite unpleasant for non Smokers. So, we found our selves another place to stay. Note that the staff were quite attentive to our needs. The room booked online was dank and musty. I was upsold new building at double the price! More expensive room - was basic but had working tv. Cleanliness leaves a great deal to be desired! Wifi is variable and non existent most of time. Showers are warm for about 4 mins. Food average- eat at snow lion, tibet kitchen or green cafe. Finally killer load of stairs to get up and down everyday. From street about 250 (poss more) stairs plus building stairs. Call ahead if u cant carry luggage down stairs. Its about 20 min walk from temple unless you're a powerwalker. Not sure why others rated it higher, but my experience ok. Ps there are no credit card facilities- so bring cash!